Die Antwoord…just as crazy as their music videos. Silly and fun to watch. Lots of jumping around while my friend who came with me and I chanted over and over again “I think you freaky and I like you a lot.” Their stuff just gets in your head and doesn’t leave. Would have liked to hear more Andrew Bird, but it was hard jumping around from stage to stage. Maybe a more intimate setting for Andrew Bird would be better. Neil Young. Very cool that I got to see him, since he’s still kickin’ it in the music world after 40+ years. Disappointed that I didn’t get to hear my 2 favorite songs live–Heart of Gold and Old Man. He played a lot of new stuff. One thing was called something like “Walk Like Giants.” It was reealllly long and the final 5+ minutes of it, all of the musicians would play a loud, reverberating note every 4-8 seconds. People in the crowd were saying “What the f*** is going on here?” because it just didn’t seem to end, but then I realized that they were creating the effect of giant’s footsteps, and it became more interesting. Not sure how many people recognized that in the audience. I’m guessing not that many because a lot of people were upset with what he chose to play. Alabama Shakes were great. The lead singer lady can really belt it out. The field was PACKED and everyone was groovin’. Big Boi was a lot of fun. I ended up right in the front middle of the huge crowd by myself. I lost my friend. Despite that, I enjoyed dancing to classic Outkast songs and songs from the last Big Boi album with random people around me and throwin’ down the A-town down hand sign with thousands of others. I guess if I could rep any southern state it would be Atlanta. I love the hip hop that comes out of there. Big Boi is coming out with another album in the winter. I heard some new song that I really loved called Gossip…something? Not sure. Anyway, Andre 3000 where are you? I’ve kept my heart 3 stax! Sigur Ros was dreamy. Definitely a show to watch while on some sort of drugs…not that I was on these said drugs. Stevie Wonder was amazing. So much fun. He was just running from one great classic to the next. One magical moment was when all of the audience and himself were singing “Imagine.” Imagine thousands of people all singing this! Intense. I loved how he invited the audience to participate, gave us harmonies to sing and cracked jokes about himself. The people on stage with him really added to the show. During the last 15 minutes of Stevie Wonder (After he sang “Don’t You Worry Bout A Thing”) my friend and I literally sprinted a mile from the front of the stage at Stevie Wonder to the far end of where all the music stages were to catch Skrillex. It was so trippy running in the dark and weaving between thousands of people facing us (and the stage). It reminded me of dodging NYC tourists in the summer….except Golden Gate park was pretty frigid during those few days. Skrillex looked like an alien party. Tons of colored strobe lights pointed their rays over the audience. Everyone was dancing and we were both glad that we had run all the way to catch the last 15 minutes of it. 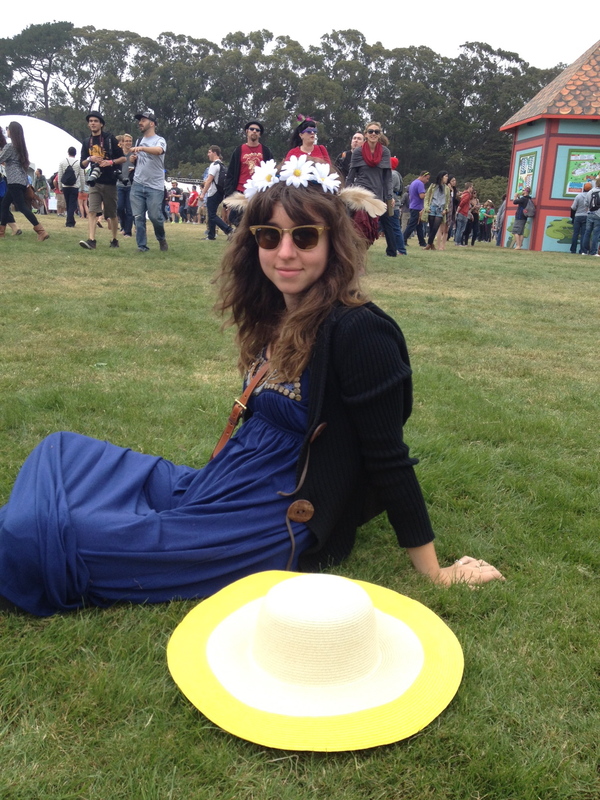 Outside Lands. Sitting in the polo field.